The journey from Seoraksan from Daejeon at first appeared to be quite a long one but, it was made easier (and cheaper) by the wonderful network of buses that link the country. 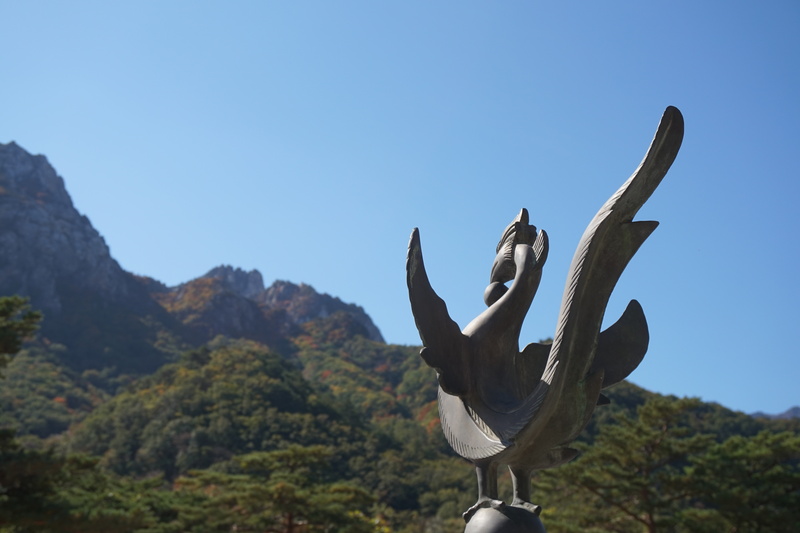 We took the bus from Daejeon to Seoul, and then onwards to Sokcho from there. We left straight after work and arrived at our hotel in the National Park before midnight. In total it took about 5 hours. Win. 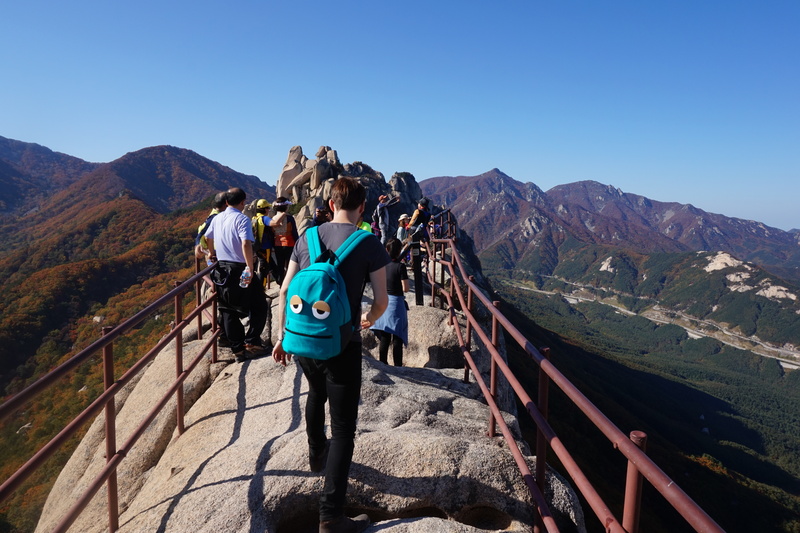 The next day we put on the many layers that had been advised by my co-workers: ‘it’s very cold in Seoraksan’, ‘you have to be prepared for the mountain’ they said and we headed out on our Korean hiking adventure. Outside, we walked the short distance to the entrance of the park. 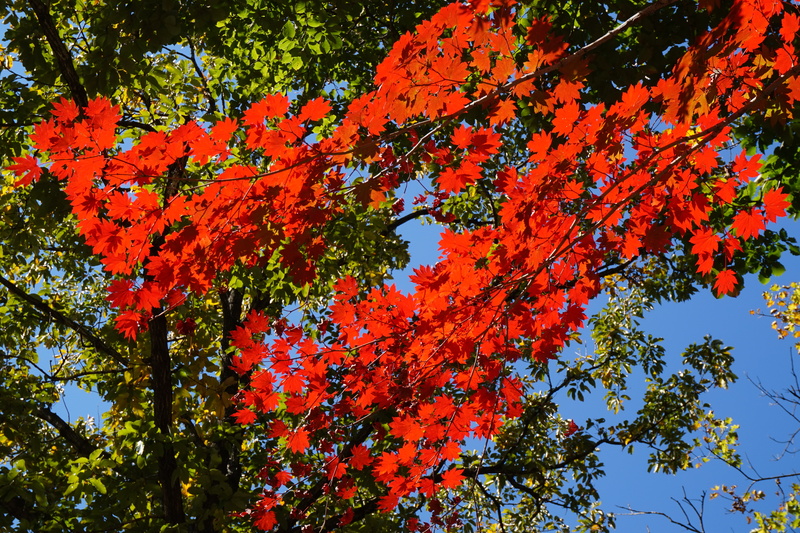 Along the road, the trees were decorated in warm hues; white jaggedy rocks soared into the sky. 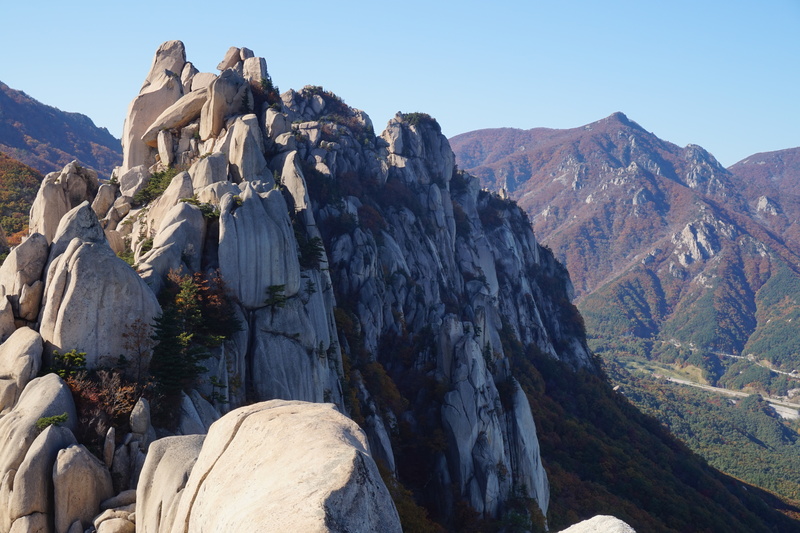 Seoraksan was as stunning as we had hoped. The weather unfortunately was a toasty 25’C which made our many layers seem like a foolish mistake (it turns out that a Korean understanding of ‘cold’ is not quite the same as a British one…). We decided to climb the emblematic Ulsanbawi (pictured below). The map estimated a two hour walk to the peak and so we thought we would be back by early afternoon, however the number of people at the park and also the fact that we stopped every few minutes to take photos, hindered our progress quite a bit. The view from the top can only be compared to that out of a plane window – big horizons and endless sky. Here there is also the world’s most convenient convenience shop which has been cobbled together on the peak of the mountain and will supply you with rather strange but delicious Korea tea and other much needed refreshments. 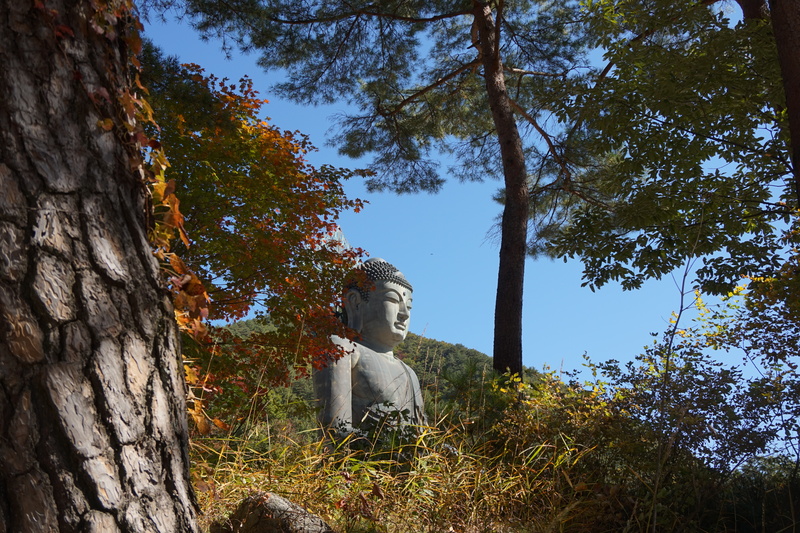 Alongside being completely breathtaking, Seoraksan national park is steeped in Buddhist history. 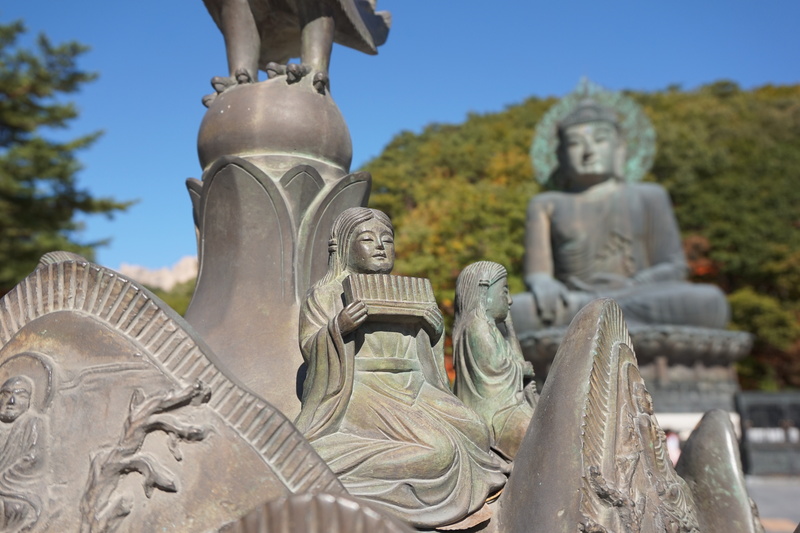 This is a significant area for the Jogye Order of Korean Buddhism and on the way to Ulsanbawi we passed the famous Singheungsa temple and the gigantic Bronze Great Unification Buddha (Tongil Daebul) Statue. However, you can find one of the most unassuming but beautiful Buddhist artifacts alongside the main road leading to the park. The Hyanseongsaji pagoda is what remains from the Hyangseongsa Temple site which at its time was the largest Buddhist temple in the region. It dates from the Unified Silla Dynasty and is the most northern of pagodas from this era. When dismantled for restoration, the stupa was found to have a space for sarira. Sarira is a broad term, but often refers to the remains of an important Buddhist. However, no relics have ever been found and so it remains a mystery as to what (if anything) was ever held here. 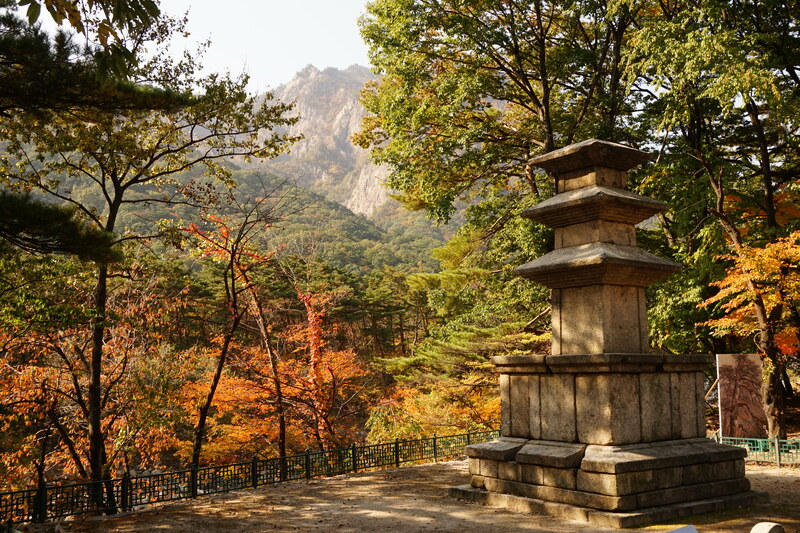 The pagoda now stands by the side of the main road, a monument to Silla Dynasty Buddhist art and a resting place for weary hikers. ← The hills are high.